You too can fly a Stearman! Tailwheel Instruction and Biplane Flights. A hands on WWII flying adventure! Flights are available in both planes. 1 passenger at a time. Fly the planes...hands on! You too can fly a Stearman! Because every pilot has a different level of experience, training time varies. Licensed Foreign Pilots do not need to go through TSA paperwork to fly with us. Longer flights are available. Please e-mail or call for prices. Rates are subject to change without notice. 7% tax not included. Treat yourself to an adventure or surprise a friend or loved one. No need to worry about duplication with this present. It's a great gift for the person who has everything. It's a unique and memorable one-of-a-kind gift. To order a Gift Certificate, please Click Here! 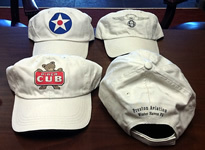 Embroidered Stearman Biplane and logo on the front, FlyTailwheel.com on the back. A variety of colors are available. Still photos e-mailed to you, $10.00. GoPro Video Available for $20.00. Bring your own GoPro and use our Mount, $10.00. CALL TODAY AND FIND OUT MORE ABOUT FLYING IN A PIECE OF AMERICAN HISTORY.